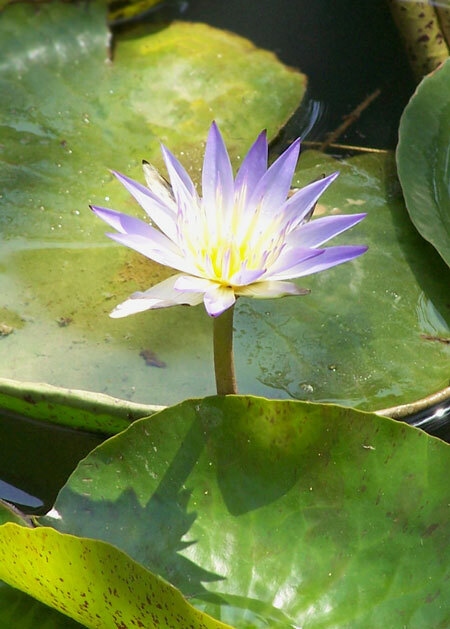 by one of our travelers, Dileep B. Beginning at your hotel in Cairo, you will be brought to the Cairo airport by an English-speaking representative. Your flight from Cairo to Amman, Jordan, leaves at 8:00 AM. 9:25 AM arrival in Jordan where you will be met by another English-speaking representative who will assist you with getting your visa, retrieving your bags and going through customs. Visas for US citizens are $15 USD, paid in cash upon arrival for US citizens. Other nationalities, please check with your local Jordanian Consulate for entry visa policies. Leaving the Amman airport* and driving southward toward Petra, your first visit is to Madaba where the St George's Greek Orthodox Church has a famous mosaic on the floor. Made during the 6th century AD, the mosaic shows the pilgrimage from the surrounding areas to the Holy Land. You can even find Egypt on this map! 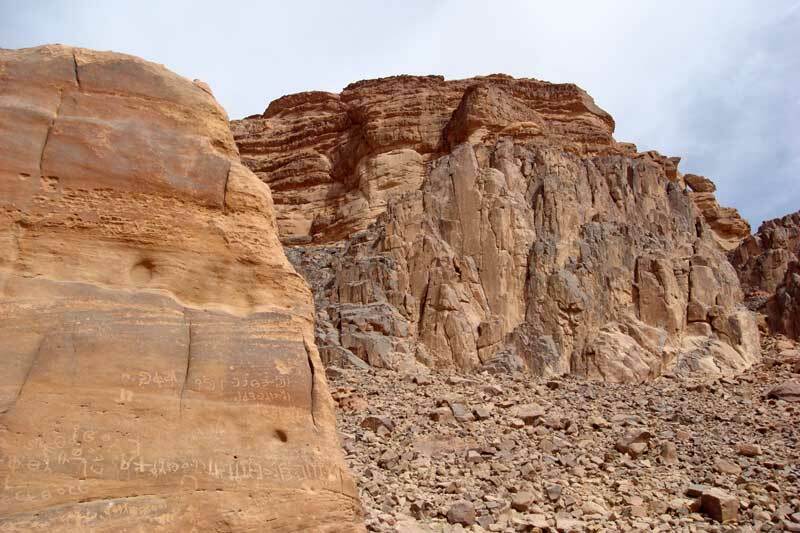 Your next visit recalls the story of Moses and his journey to the Promised Land. At Mount Nebo there is a Memorial for Musa (Moses) and a 4th century church which Italian Franciscan priests excavated and restored in 1933. The panoramic view overlooks the Jordan River Valley, the Dead Sea, Jericho and Jerusalem. In the Bible story, Moses does not ever arrive at the Promised Land, but he is able to see it from a distance before he dies. 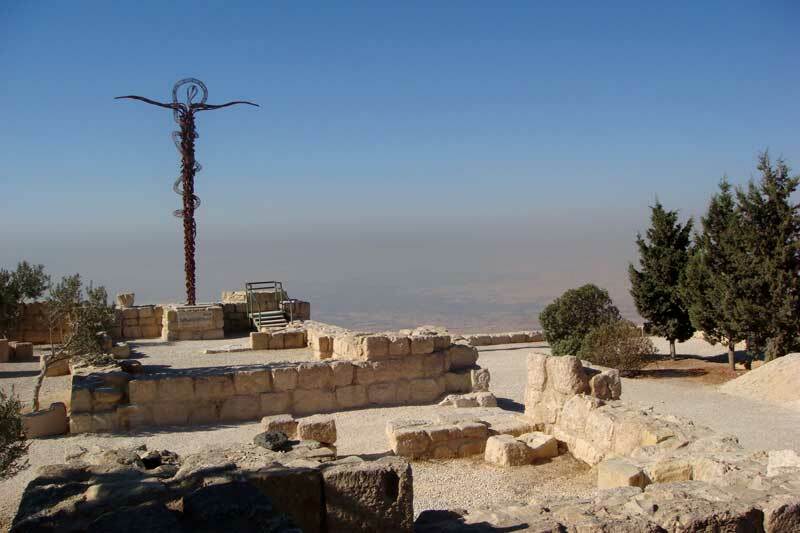 It is from Mount Nebo that one can see it in the distance (on a clear day). It is also believed that this is the burial place of Moses. Afternoon arrival in Petra and time to get situated in your hotel. The 5 star Movenpick Resort Petra Hotel is located at the entrance of the Petra site. Optional add-on: Drive from the Amman airport to Petra via the Dead Sea, the lowest place on earth. Float in the mineral rich waters at one of the Dead Sea spas. You can still visit Madaba and Mt. Nebo if you choose this option. Cost: $60 per person. Includes entrance fee and transfer. *Note: You can also substitute sightseeing at Jerash for the sightseeing at Madaba and Mount Nebo on arrival day. You would then do Madaba and Mount Nebo on your last day, before departure from Amman airport. Contact us for the current price for the addition of Jerash to this program. Jerash is the best example of a Roman provincial city in the whole Middle East. You will visit Hadrian's Arch, Hippodrome, a colonnaded street, the cathedral, North Theater, South Theater and the Jerash Archeological Museum. Overnight Movenpick Resort Petra Hotel, 5*. Buffet Breakfast included. Contingent upon availability. Other 5 star hotel options: Petra Marriott, Movenpick Nabataen Castle, Crowne Plaza. Please inform us if you would prefer one of these other hotels. in Petra A full day of sightseeing in the Red Rose City of Petra. First established during the 6th C. BC by Nabataen Arabs, Petra became a trading center for the caravans during what was the Ptolemaic era in Egypt. Hailed as one of the New 7 Wonders of the World, it is a magical experience to enter this hidden city through a long narrow Siq. The natural beauty is breathtaking, and then to find beautifully carved buildings made by human hands is a memorable experience. Your 3-hour guided tour will include the following sights: The famous Treasury, Pharaoh's Castle, the Triumphal Arch, the Amphitheater, Qasr-El Bent. After your guided tour you can continue to explore. There is the Monastery, a small museum and other smaller structures. There are also restaurants within the site where you can relax and refresh yourself while enjoying the beauties of the surrounding landscape. Camels and donkeys are available for hire within the site. A horseback ride from the parking area to the beginning of the Siq is included, if you would like to try that. Wadi Rum You have some free time this morning before leaving about 2:00 PM for the airport in Amman. You can make a second visit to the Petra site on your own or add one of the options below. -Visit the Shobek Crusader Castle on your return trip to Amman. 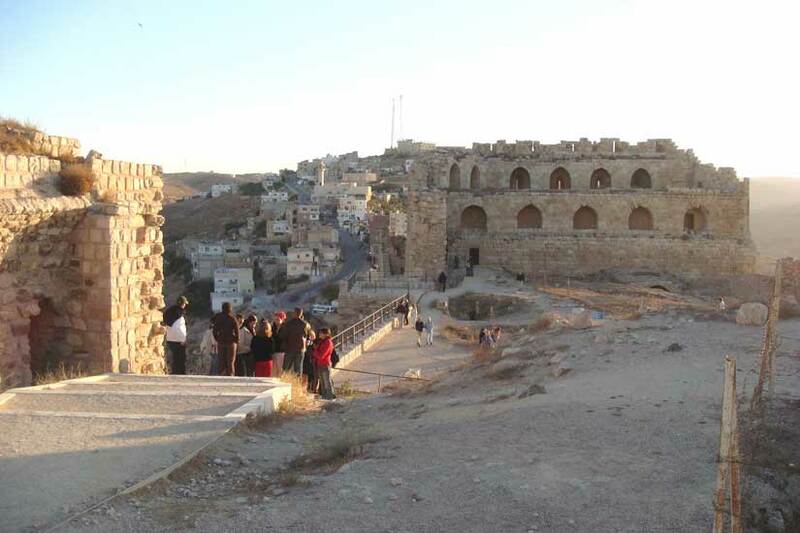 -Visit the Al Kerak Crusader Castle on your return trip to Amman. -Trip to the Wadi Rum with a 2-hour off-road excursion (in 4-wheel drive vehicle) to see desert landscapes and rock art inscriptions. Video of Wadi Rum by one of our travelers. Your flight from Amman back to Cairo leaves at 7:25 PM. 8:55 PM arrival in Cairo. Assistance at both airports by English-speaking rep's, and a transfer to your hotel near the Cairo airport. Overnight at a hotel near Cairo Airport: 4* Novotel Heliopolis or similar. Buffet Breakfast included. Optional 5* Hotel upgrades available upon request. Departure from Cairo, Egypt Check out of your hotel by noon and depart for home. There is no transfer to the airport included in your tour. The hotel has a free shuttle bus. If you would like a private transfer, this can be arranged. $120 USD/night off for singles & solos for a 4 star hotel in Petra. 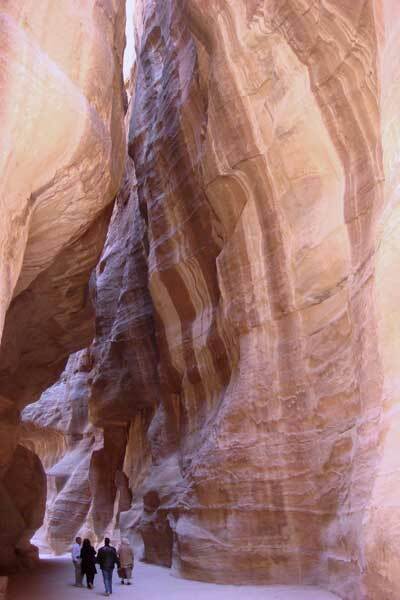 - $45 USD pp in double room/night off for 4 star hotel in Petra. $120 USD/night off for singles. Movenpick Resort Petra Hotel or similar, 5*: 2 nights. Contingent upon availability. Other 5 star hotel options are: Petra Marriott, Movenpick Nabataen Castle, Crowne Plaza. Please inform us if you would prefer one of these other hotels. Novotel Cairo Airport Hotel, 4*, or similar: 1 night. Private expenses - laundry, phone calls, etc. Transfer to Cairo airport for final departure from Egypt (can be added). Anything which is not included in the "Included in this Tour" list above or which is not specified as included in the Day-by-Day Itinerary. PT-3 - "3 Nights in Petra"
Leaving the Amman airport and driving southward toward Petra, your first visit is to Madaba where the St George's Greek Orthodox Church has a famous mosaic on the floor. 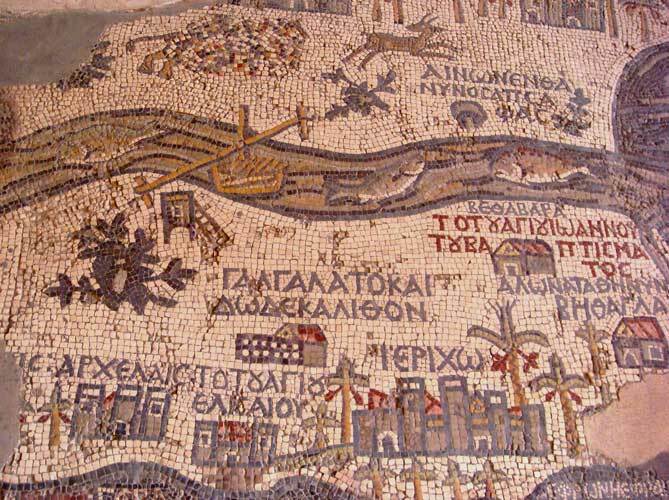 Made during the 6th century AD, the mosaic shows the pilgrimage from the surrounding areas to the Holy Land. You can even find Egypt on this map! In the Bible story, Moses does not ever arrive at the Promised Land, but he is able to see it from a distance before he dies. It is here from Mount Nebo that one can see it in the distance (on a clear day). It is also believed that this is the burial place of Moses. Wadi Rum You have a free day in Petra today. You can make a second visit to the Petra site on your own or add one the options below. -Trip to Wadi Rum with a 2-hour off-road excursion (in 4-wheel drive vehicle) to see desert landscapes and rock art inscriptions. -Mud bath at local spa. -"Petra by Night" is offered on Monday, Wednesday & Thursday evenings. Castle You have some free time this morning before leaving about 3:00 PM for the airport in Amman. You can make a second visit to the Petra site on your own or add one of the options below. -Trip to Wadi Rum with a 2-hour off-road excursion ( in 4-wheel drive vehicle) to see desert landscapes and rock art inscriptions. Overnight at a hotel near Cairo Airport: 4* Novotel Heliopolis or similar. Breakfast only included. 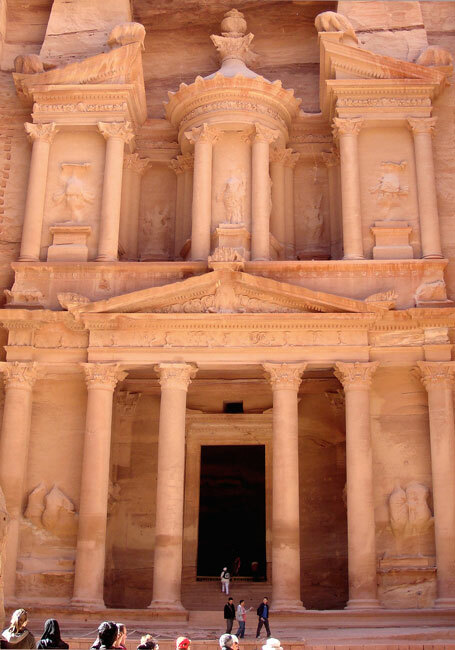 $120 USD/night off for singles & solos for 4 star hotel in Petra. - Additional discounts during Low Season: 12 Jan - 16 Feb.
Movenpick Resort Petra Hotel, 5*: 3 nights. Novotel Cairo Airport Hotel, 4*, or similar: 1 nights. Photo credits this page: All photos by Ruth Shilling.